This is the last in a series of 9 articles based on research findings from our e-commerce product list usability study. When usability testing 19 sites and benchmarking 50 major e-commerce sites on Product Lists & Filtering usability we found that 84% of the sites had a mediocre or poor filtering experience – the most common culprits being a lack of key filtering options, poor filtering designs, and filtering logic that doesn’t align with users’ expectations. Only 16% of websites provide a good filtering experience, with sufficient filtering types available, a balanced filtering design and a filtering logic that aligns well with user expectations. Luckily there are a few sites that stand out from this generally sad state of affairs and provide their users with an overall great filtering experience. One of those sites is Macy’s. Macy’s ranks #4 when measured on “Filtering” performance in our Product List & Filtering benchmark of 50 major US e-commerce sites. The “Filtering” experience scores are based on 35 filtering usability guidelines, divided into 4 themes: Available Filters, Filter Logic, Filtering Interface, and the Applied Filter State. Across all 50 e-commerce sites benchmarked this gives us 1,750 performance scores for analysis. In this graph we’ve summarized the scores across the 4 filtering themes, and segmented out Macy’s scores for comparison against the average top US e-commerce site. 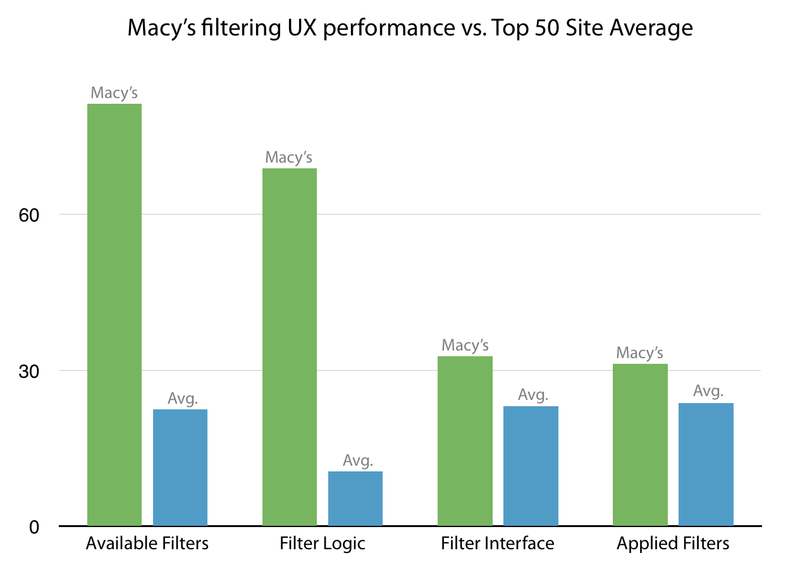 It’s clear that Macy’s great filtering experience performance is mainly due to significantly better filter availability and logic – 350% and 650% over the performance average score of the remaining 49 top US e-commerce sites. We’ll cover 7 concrete filtering implementation aspects at Macy’s which during our usability testing were identified to be the high-performing designs. This include best practice examples of the available filter types, the filtering interface, applied filter state, promotion of popular filters, the user’s back button expectations, and more. Most of the time, users are interested in filtering a product list across category-specific attributes, and not just a few generic site-wide attributes such as brand, price, user ratings, etc. For a category like ‘Coats’ that might mean the ability to filter by ‘Material’, while for ‘TVs’ it could be the ‘Refresh Rate’, and for ‘Bowls’ one could easily imagine filtering by ‘Volume’ capacity. These would all be examples of what we call “category-specific filters” – they are filter types that are specific to those particular categories. For instance, it wouldn’t make sense to have the ‘Refresh Rate’ filter from ‘TVs’ appear when in the ‘Bowls’ category because it is a product attribute specific to TVs and therefore isn’t relevant to kitchenware. Sadly, a staggering 42% of major e-commerce sites lack category-specific filtering types for several of their core product verticals. With filtering options this basic missing on so many sites it’s easy to understand why 84% of sites still have far to go when it comes to their overall filtering experience. Generally, we’ve found during usability testing that any product specification that is important enough to be shown in a product list item should also be available as a filter. Not only because the information types in the list item are (or at least should be) the product attributes the user cares the most about, but also because testing revealed that the mere display of certain product attributes increased the subjects’ desire to filter by those attributes. By virtue of highlighting the product attribute to the user, you remind them that the spec is important (or in the case of users new to the domain, teach them that it is), and the very display of the spec therefore encourages users to filter by it. For instance, if a collection of bed sheets has ‘Thread Count’ displayed in each list item, users will be more likely to want to filter that product list by ‘Thread Count’. 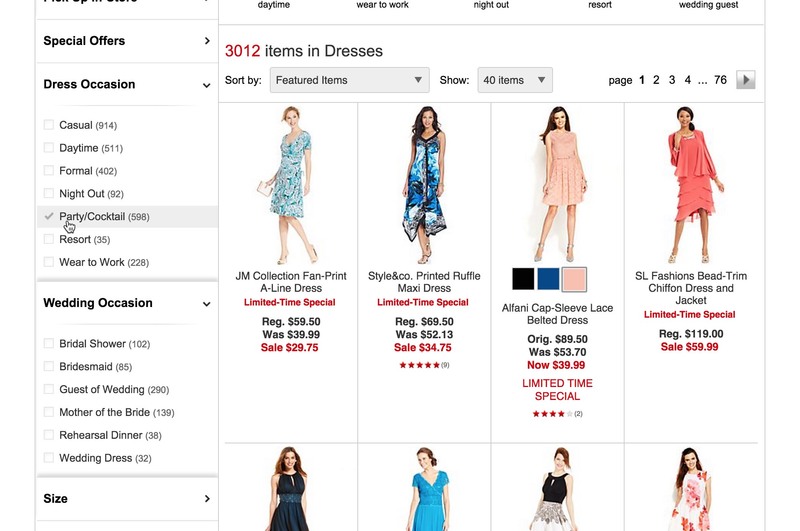 Looking at Macy’s, we can see how they offer both category-specific filtering and allow their users to filter by the attributes displayed in the list item. 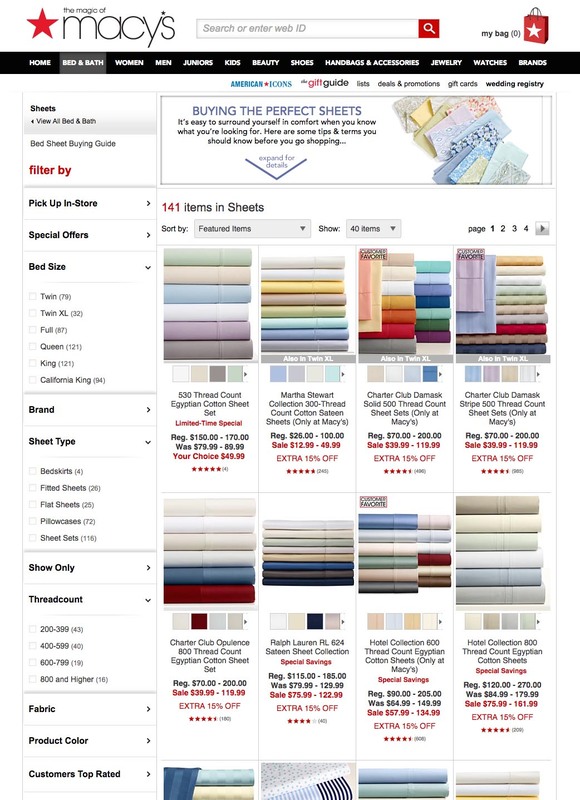 Notice how the list items display sheet type, fabric and thread count – and how Macy’s also offer category-specific filters for all of these product attributes. Tip: To read more on our test findings on category-specific filters see our article posted at Smashing Magazine (see section 2: “42% Lack Category-Specific Filter Types”). Often the product list of a given category or a set of search results will have an handful of filters which are highly beneficial for the majority of users to consider applying, as it will vastly increase the relevancy of the items in an otherwise very generic product list. For example, if a user navigates to a “Digital Cameras” category, “Camera Type” would be a highly important filter type, since the user’s needs will vary greatly depending on whether they are looking for a “Point & Shoot”, “DSLR”, or “Mirrorless” camera. Only displaying these as traditional filters in a filtering sidebar increases the risk of users overlooking the options or not understanding the importance of making the selection. 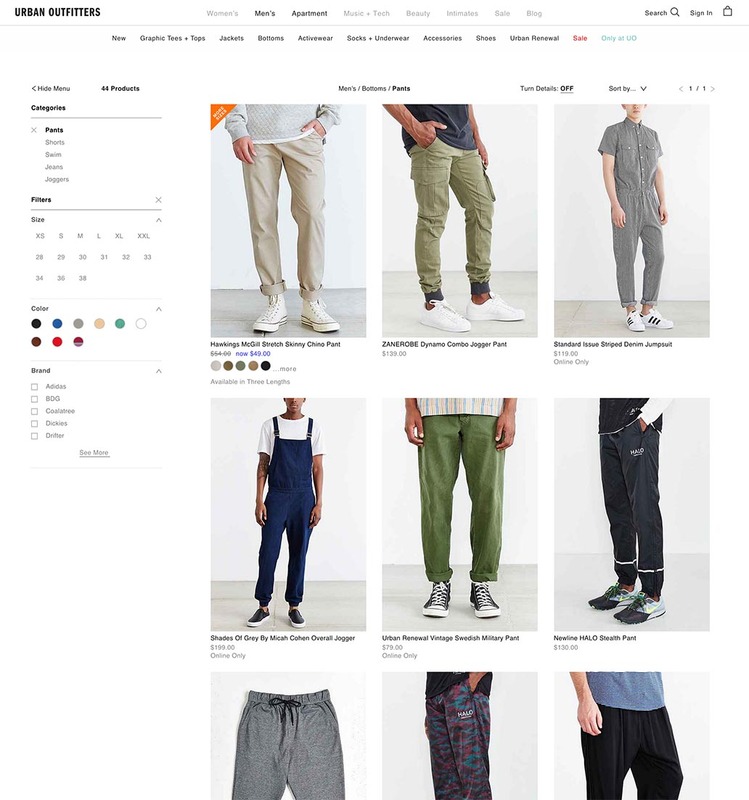 During our e-commerce usability tests, we typically observe that users perceive categories as something the site suggests they select whereas the filtering sidebar options are seen by most users as purely optional choices. It’s therefore a good idea to promote particularly important filters (or filter combinations) on top of the product list to encourage their selection. During testing a very clear pattern emerged on how a limited set of highly important filters can be given extra exposure: by highlighting them above the product list. 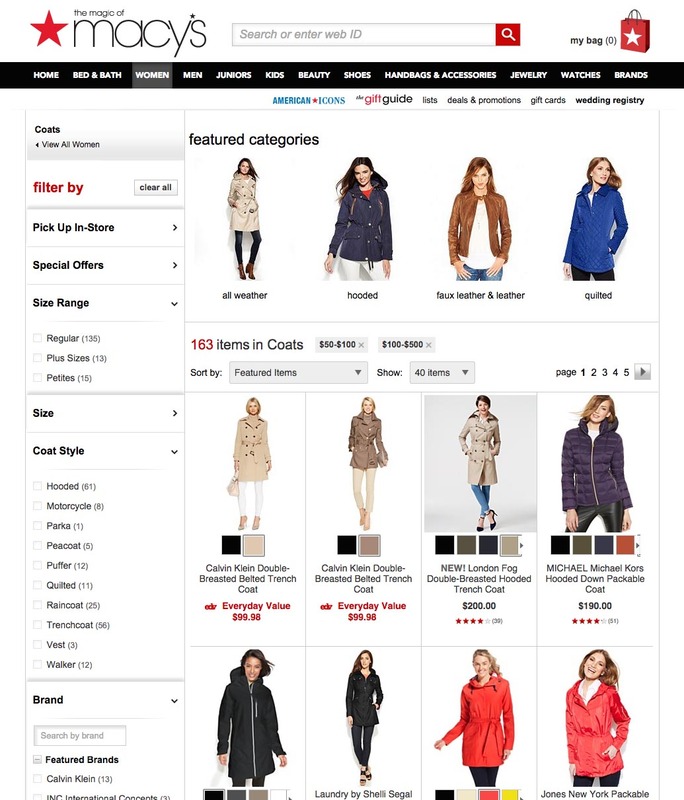 We once again find an example of this at Macy’s, where a select number of coat style filters are promoted in the Coats category (note: they are filters despite Macy’s calling them “featured categories”). The test subjects often interpreted this type of promoted filters as the site encouraging them to select one – and consequently sites with such promoted filters saw much higher filter utilization rates than sites that didn’t promote them. Despite this being a very effective nudging technique, only 16% of e-commerce sites currently have “promoted filters”. A word of caution though: the vast increase in attention and utilization that promoted filters receive means that they should be used sparingly. It is only when the vast majority of users will benefit greatly from applying one of the promoted filters that they should be there. Otherwise, users are simply lured into overly narrow product lists – which is a very severe product browsing issue that we often observe leading to site abandonments. It’s therefore an absolute ‘no go’ to promote only moderately important filters. Significance over Consistency – The promoted filters don’t necessarily need to be of the same type. It’s all about promoting the most important product concerns to the user, which in some cases might mean promoting filters of different types (or even combining multiple filters into one). For instance, Walmart promotes a fairly diverse set of filters in their laptop category, right from ‘Touchscreen Laptops’ (feature filter) to ‘Chromebooks’ (Operating System filter) to ‘11-14” Laptops’ (screen size filter). Careful Curation – Because many users will perceive the promoted filters as site “recommendations”, it is essential that they only appear when there are truly meaningful selections to be made. The promoted filters therefore need to be very carefully curated and may in some product verticals require on-going review. (Note: the filters will of course very often be category-specific filters, which we described in section #1 of the article). Keep in Original Position – The promoted filters should alway be displayed in the filtering sidebar as well (i.e. in addition to the “promotion” placement). Through two decades of browsing e-commerce sites, most users have been trained to reach for the filtering sidebar when they want to narrow down their product list, and some users will therefore only look for a filtering value there. Avoid Banner-Like Graphics – A few of the test sites promoted filters in banner-like graphics. Unfortunately, these were consequently completely ignored by the test subjects – presumably due banner blindness. For examples of this, see our article Avoid These 5 Types of E-Commerce Graphics which dives deep into our test findings on that topic. Note: A few sites will be able to use a horizontal filtering toolbar – as described in Filtering UI: A Horizontal Toolbar Can Outperform the Traditional Sidebar – which eliminates the need for promoted filters. When it comes to filtering logic the filtering values should, in general, not be mutually exclusive within the same filter type. Memorize the interesting products for filter value 1. Memorize the interesting products for filter value 2. Finally, the user must now mentally combine the two memorized product matches to get an overview of the products relevant to their needs. And that is when the user wants to apply just two filtering values – imagine how complicated this gets when they are interested in more than two filtering values of the same type! Now, before thinking that such poor filter implementations never occur, our benchmark revealed that one third (!) of the 50 top grossing US e-commerce sites have such implementations – wrongly implementing most or all of their filtering values as mutually exclusive. Unsurprisingly, this severely obstruct their users’ filtering (and thus product finding) abilities. Can now look through all the products in the combined filtered product list. During the test sessions 45% of the test subjects combined multiple values within the same filtering type (on the sites where it was possible). Some of these subjects even got a little creative and used this feature as a way to filter out unwanted product variations by applying all other / opposite filtering values. For example, if a subject didn’t want light-colored towels, they would weed out these products by applying all of the other color options. Thematic browsing patterns are quite common in physical retail, where any sales assistant will be able to help store visitors with common requests such as “a casual shirt”, “spring jacket”, “high-end pocket camera”, “value-for-money LED TV”, etc. Yet despite such thematic attributes often being both common and central aspects of the user’s purchasing decision, our benchmark reveal that 20% of the top e-commerce sites lack thematic filters (although support for it has increased by 18% since our study on E-Commerce Search). While TVs, cameras, jackets, and shirts can all be easily located on most e-commerce sites, only seeing products that match a certain “theme” will be next to impossible for users if the site doesn’t offer thematic filters. I’m too impatient for this kind of thing. They would have lost me. [..] Normally you can choose between winter jackets, spring jackets or the type of jacket,” one of the test subjects explained while looked for a spring jacket on Gilt. He ended up abandoning the site. Without thematic filtering options, it is often unreasonably time consuming for users to see only the products of interest to them. During testing, a lack of thematic filters often led to site abandonments because the subjects prematurely concluded that the store either didn’t carry the type of products they wanted (e.g., spring jackets), or, more often, that it would be nearly impossible for them to find the few relevant items that might be hidden somewhere in those vast product lists. The test sites that both displayed the applied filters in their original position in the filtering sidebar, and displayed a summary of all applied filters at the top of the product list, had a vastly lower rate of user errors and misinterpretations than the sites that displayed applied filter in only one of these positions. While seemingly simple, 42% of e-commerce sites only display applied filter in one of these positions – despite the rather severe usability issues that can arise as a consequence. You can find the whole set of test findings in our recent article on How to Design ‘Applied Filters’. The filtering values are displayed using an inline scrollable area. This approach of “scrolling within scrolling” is difficult for users to grasp and even more difficult for them to actually interact with. 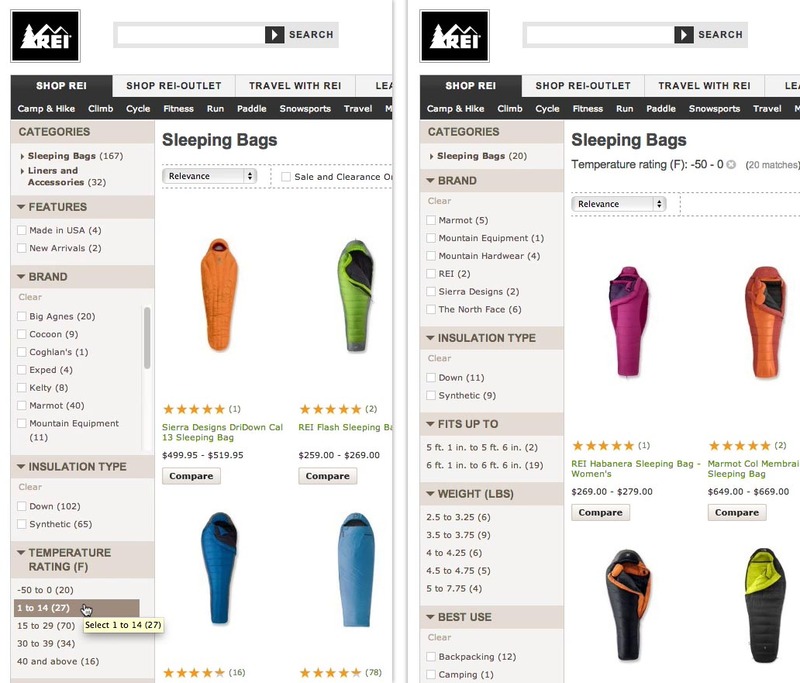 Inline scrollable is currently being used for long lists of filters by 24% of e-commerce websites. Macy’s display up to 10 values before truncating. Around 10 values is the sweetspot. Having too few visible values was observed to confuse users and hide too many options. Meanwhile displaying much more than 10 values impeded the user’s overview of the other available filtering types (the reason for truncating the list in the first place). 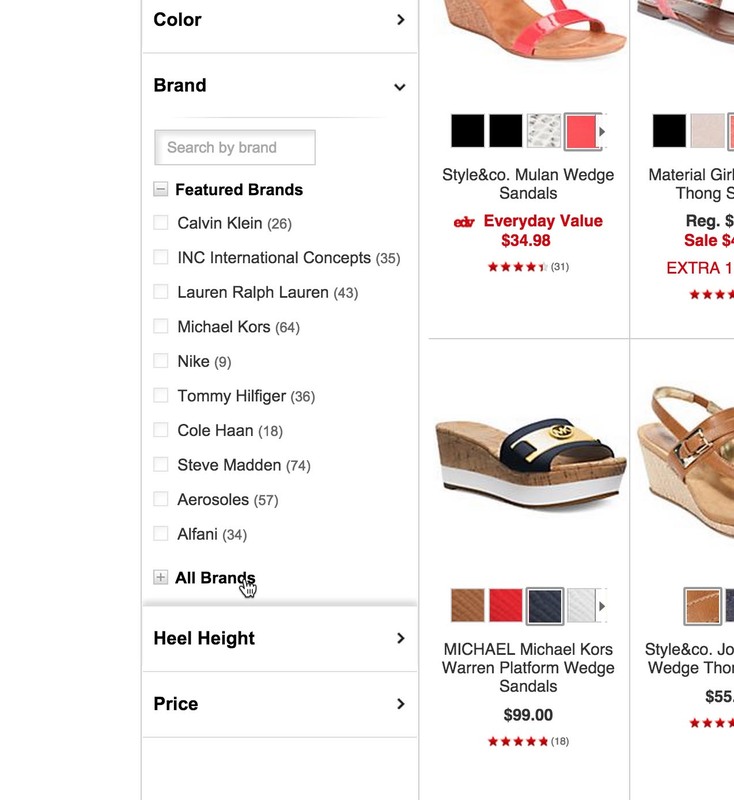 Macy’s visually indicate that additional values are currently hidden and can be expanded by using a + icon. To perfect their truncation design Macy’s could consider either rewriting the ‘Show All Brands’ link to include the total number of brands available or visually fade the last visible filter value – two details which during test proved to increase emphasis on the list of filters only being partially displayed. Also the proximity could be tweaked (e.g. by adding slightly more white space below the truncation link) to make it abundantly clear that the ‘All Brands’ option belong to the list of filters above it and isn’t a standalone option or related to the items below. During our usability studies we time and again see test subjects relying extensively on the browser back-button. This of course isn’t a problem in itself. However, we frequently observe confusion, disappointment, anger and even abandonments, when a site’s technical implementation break with the user’s expectations of how the back button should function. Generally users expect the back button to take them back to what they perceive to be their previous page. And this is where the typical misalignment occurs: when users click a button or a link, wait for content to load, and then see an overall set of new content, they expect it to be a new view that they can click “back” to - regardless of whether it is technically the same page or not. As applying filters generally include a click, content loading, and a new set of visual content, it should come as no surprise that users consistently during testing perceived this as a new page. And as a consequence the subjects naturally tried to click “back” to previous filter states. Unfortunately, one third of the leading e-commerce sites break this expectation. To align the back-button behavior with user expectations during filtering, Macy’s invoke a URL rewrite for each filter applied. Something 66% top e-commerce sites do. This is typically done using the HTML5 History API, which enable sites to invoke a URL change without a page reload, making it possible to add each filter and sorting change as a separate entity in the user’s browser history without invoking needless page reloads. For more on our test findings on how and when users’ expect browser back-buttons to work, see our article on 4 Design Patterns That Violate Back-Button Expectations. The user’s filtering experience is a central part of the product browsing experience. 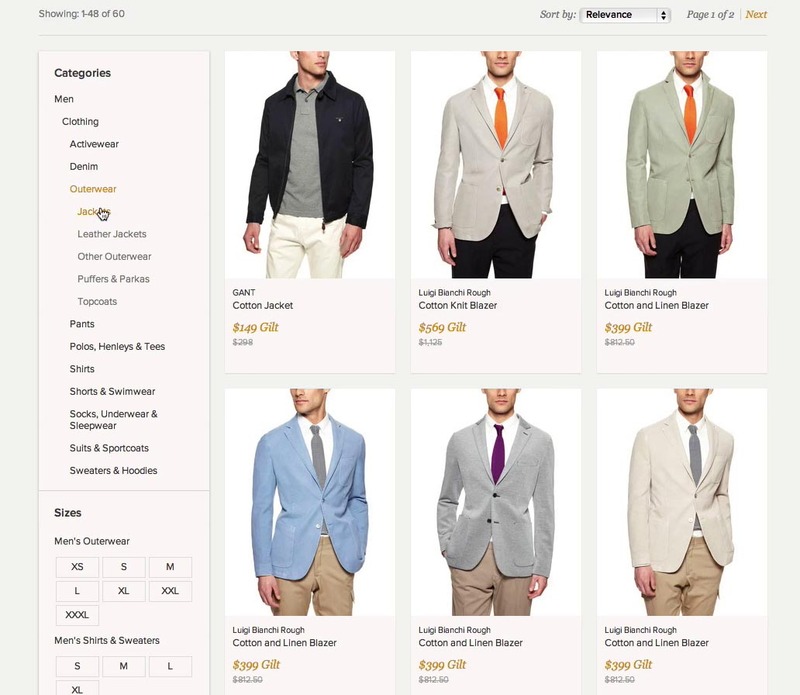 When done well, filters can empower users to narrow down a product catalog of thousands to just a handful of products that match their unique purchasing preferences. The availability of category-specific filters, e.g. a ‘Thread count’ filter within a ‘Towel’ category. In comparison, 42% of e-commerce sites don’t have category-specific filters for one or more of their core product categories. 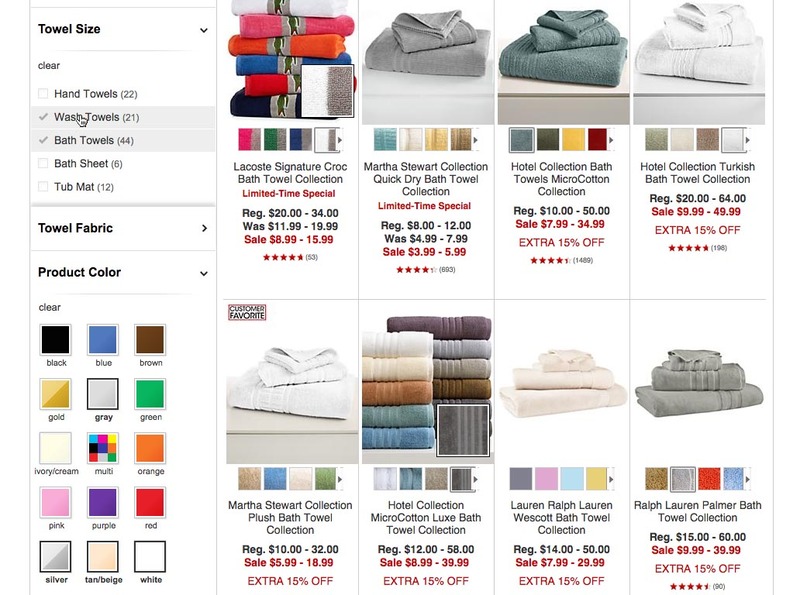 In select categories, where the majority of users’ will benefit from choosing among a particular set of filters, Macy’s promote such filters above the product list. 84% of e-commerce sites don’t utilize this nudging technique. 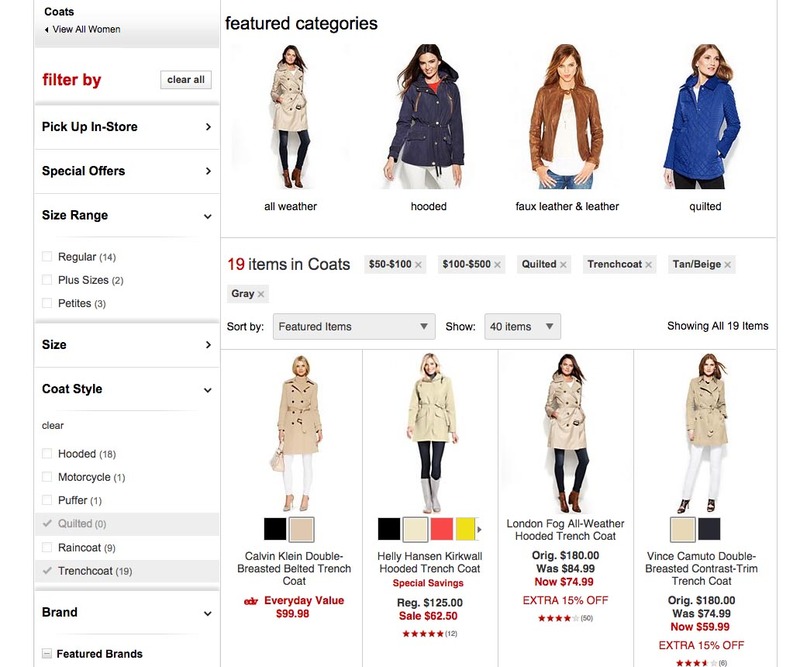 Users’ desire for thematic browsing is supported through thematic filters, such as “Style” filters, allowing them to see only a “thematic subset” of products within a product category. Among general e-commerce sites, 20% don’t have such thematic filters despite selling products with obvious thematic attributes (e.g. season or style). 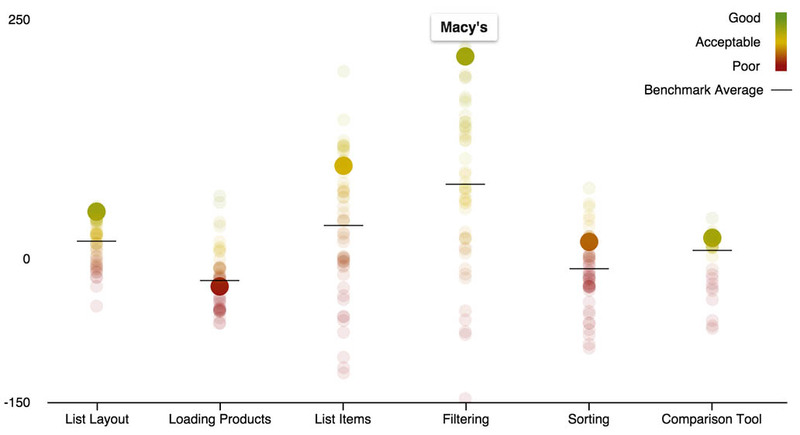 Although Macy’s filtering experience is good, there’s of course still room for improvement. For example there’s a noticeable lack of compatibility filters for the compatibility-dependent products they sell. For instance, phone cases don’t offer filters for phone model or device size, making it virtually impossible to see only the cases relevant to the user’s specific phone. There’s also a lack of a “New Arrivals” filter, which during testing proved immensely popular and powerful in combination with other filters – in particular on seasonal sites like apparel and home decoration. Sears, L.L.Bean, Wayfair, Nordstrom, and Amazon. Authored by Christian Holst. Published on July 1, 2015. It would be so great to have the ability to have Exclude filter options as wel! So for example Gentleman, Jackets, Size, Colour, BUT NOT Leather. Is there any (largish) website that has that? Great article! Very good to have so many good examples and to substantiate it with survey outcomes. Thank you for this very well written, helpful article. Good to know what makes for good filtering experiences. Must read! Clear, to-the-point and great examples which can be applied immediately. Thanks for gaining these insights and sharing those. Very detailed as always. Although I was searching how filter values shall be sorted as a benchmark and did not found a hint. Any research have been done on that? Yes we have quite some research findings on this.